Located in the City’s diplomatic area, only 5 km from Tan Son Nhat International Airport, Liberty 1 Hotel is a home away from home to many travelers who come to Ho Chi Minh City for business or pleasure. With 51 air-conditioned & carpeted rooms – including 1 Liberty suite, 5 suites, and 15 deluxe rooms – Liberty 1 Hotel will provide you the homely comfort when apart from home. Connecting rooms & family rooms are also available for your convenience. Function room with seating capacity of up to 180 people is available. Outside Catering:Our professional Chef and the Catering Team are available to serve at your private parties. 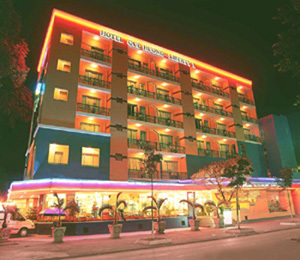 Windy Club: A unique feature of Que Huong-Liberty Hotel because of its underground location. Luxurious decorations with modern sound systems, the lively atmosphere promises to bring you lots of good times.Opening time: 10.00 am - late. Windy Karaoke: With our warmly decorated karaoke rooms, you can enjoy your favorite songs in a private and cozy atmosphere.